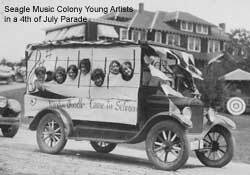 Seagle Music Colony, the oldest summer singer training program in the country, was founded in 1915, by world renowned baritone, Oscar Seagle. Oscar made several concert tours in the United States and Europe, and recorded albums for Columbia, including the popular World War I hit “Dear Old Pal of Mine.” He served from 1903-1914 as teaching associate in Europe with his teacher, the great Polish tenor Jean de Reszke. De Reszke was a star of the Metropolitan Opera as well as Queen Victoria’s favorite singer. When Oscar returned home, he opened a studio in Hague, on Lake George, in 1915. 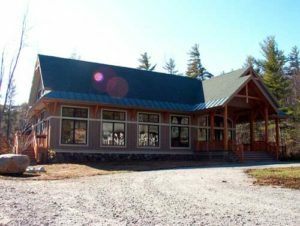 He then moved to Schroon Lake and taught at the Brown Swan Club, which is now the Word of Life Inn. In 1922, Oscar bought the property where the Colony currently stands. The Colony was quickly nicknamed “Olowan,” an Indian name meaning “Hill of Song.” Mr. Seagle’s reputation made the Colony a magnet for aspiring singers. During the 1920s, up to 125 students would come each summer, and in the winter many would follow him to Nice, France for further study at the de Reszke-Seagle School. Oscar’s son John was among the most prominent of his pupils. Born in Paris, France on February 15, 1906, he grew up hearing fine singing from morning to night. When the Seagles left Europe during World War I, John entered the Choir School of St. John the Divine in New York City, where he was the soprano soloist for three years. The Seagle Music Colony Singers were one of the first groups to perform before television cameras. John Seagle served on the staff of WRGB in Schenectady, NY, where Colony singers were frequently called upon to perform. 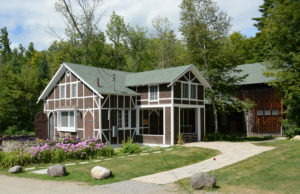 The Colony Opera Guild was formed in 1941 and performed for several years at the Wikiosko Barn Theatre on Lake George, which was the Bolton Road home of Mrs. Charles Peabody. After Oscar Seagle’s death in 1945, John directed and taught voice at the Seagle Music Colony from 1945 to 1985. The old barn that was Oscar Seagle’s studio in Schroon Lake was extended into a theatre in his memory. John also taught voice at Trinity University in San Antonio, TX and continued to sing on radio, television and the concert stage. He was honored in June of 1996 by the Schroon Lake Chamber of Commerce as Schroon Lake’s Citizen of the Year. John died in 1997, and the John and Helen Seagle Scholarship was established in memory of John and his wife, who gave many years of devoted service Seagle Music Colony. Under the stewardship of John’s son Peter, his wife Dodie and their three sons, the Colony carried on many of the same traditions over the years. Then, in 1996, Darren K. Woods was hired as General Director. Under his leadership, and with a core staff consisting of Richard Kagey and Tony Kostecki, the Colony has grown to become the “Best Summer Vocal Training Program in the United States” (Classical Singer Magazine, 2000). Today hundreds of applicants vie for the opportunity to attend the Colony. In the past twenty years, the Colony has grown from two productions and eight performances per summer to six full productions and over thirty-five performances. This growth mandated the need in 2008 for Tony Kostecki to move to full-time resident General Director and Darren Woods to transition to part-time summer Artistic Director. In 2017, Darren returned to the Colony full-time and added to his duties, leadership of the Colony’s fundraising efforts. From its beginning in 1915 and to this day, young singing actors travel from across the country to study with the wonderful faculty and staff that gather every summer “on the hill.” In addition to invaluable performance experience in opera and musical theater, each emerging artist receives weekly music coachings and private voice lessons by the exceptional faculty. Artists also take part in career development classes, acting and dance lessons., Further, they sing in master classes for famous singers and artist managers, and learn the ins and outs of the world of opera and musical theater.